What Day Of The Week Was February 22? 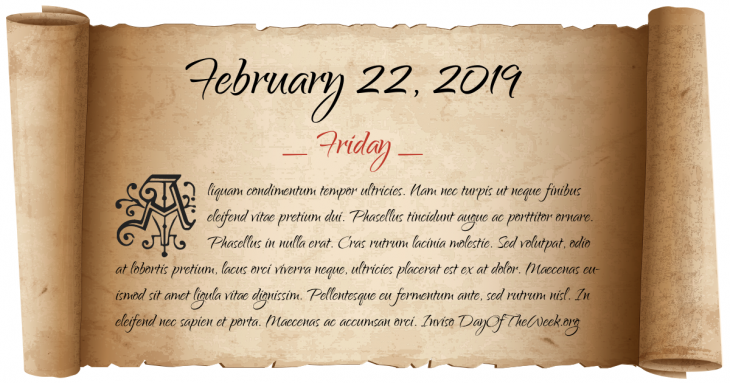 February 22, 2019 was the 53rd day of the year 2019 in the Gregorian calendar. There were 312 days remaining until the end of the year. The day of the week was Friday. Galileo’s Dialogue Concerning the Two Chief World Systems is published. Ngo Dinh Diem of South Vietnam survives a communist shooting assassination attempt in Ban Me Thuot. Who were born on February 22?